Almost every city in the DFW area is imposing stringent water restrictions. It doesn’t look like the drought is going to end anytime soon. That might mean you’re looking into native landscaping plants or saving up your irrigation to carefully keep your lawn green. But make sure you dedicate some of your water to watering the soil around the edge of your foundation slab. Shifting soil puts stress on your foundation, and that leads to cracks. There’s not much you can do to directly impact the dirt underneath your foundation. But there’s plenty you can do to protect the soil around the sides of it. This soil contracts when it gets too dry. The same heat and water loss that makes the ground crack even in winter can make the soil start to pull away from your property’s edges. That means there’s not as much support to keep everything stable. Even worse, dry spells broken up by torrential rain send water pouring into those open gaps. That pushes at the foundation and the surrounding soil even more. This is part of what makes your foundation ‘settle,’ not just age. Without that support, the weight of your house puts more stress on some corners. These will eventually crack, and those cracks will continue to widen. How does watering the foundation help? If you can keep the soil’s hydration relatively consistent, that helps keep the soil in place. It’s less likely to pull away from the edges of your home, and the soil won’t contract and leave less support. 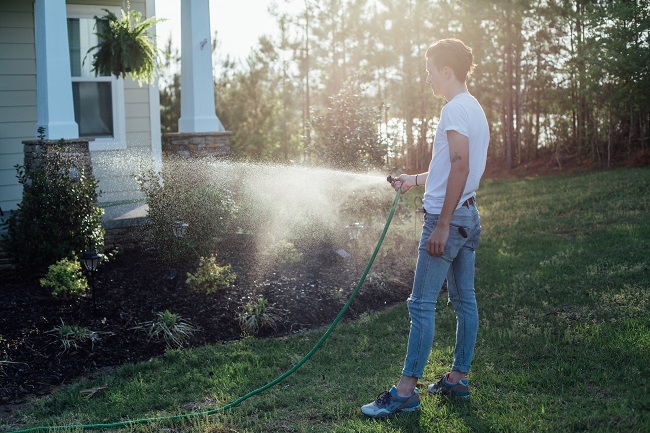 Use soaker hoses to let water seep into the ground with minimal waste. Keeping the edges of your foundation shaded with shallow-rooted plants is also a great way to minimize evaporation, especially since the roots won’t hurt the concrete. Go to Dodson Foundation Repair for more ways to keep your foundation in great repair.